I awoke in the middle of the night to the sounds of high winds and heavy rain. It was still raining when we finished breakfast, and it was not clear whether we would be riding in the morning. We decdided to wait it out, and while we were doing so, Javier introduced us to the cultural phenomenon of drinking mate (yerba mate), an herbal tea that is immensely popular in South America. 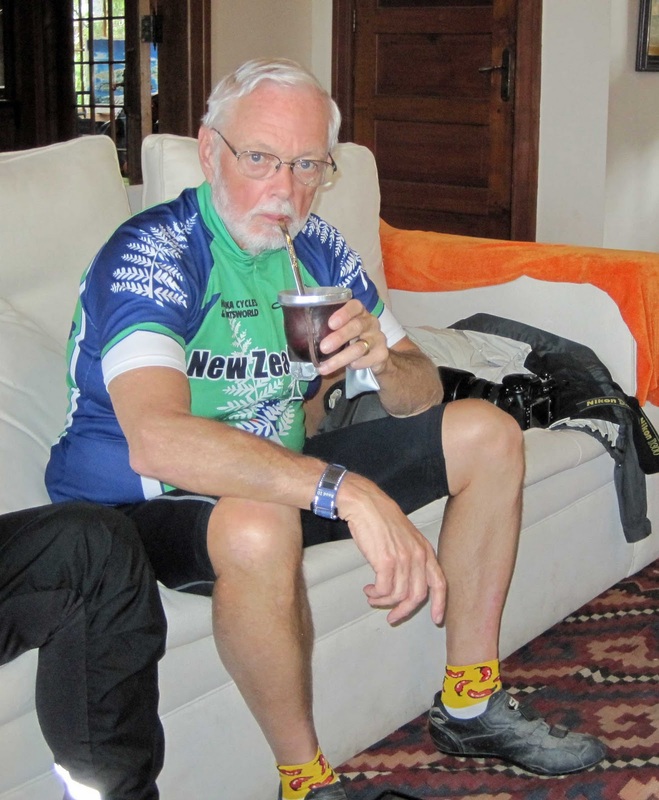 By 10:30 the rain had abated and Doug Darby and I set off on our bicycles. Several others opted to have the van take them past the gravel road, or past the first climb. I started out with my rain gear (which turned out to be unnecessary) which quickly became a sauna suit, so I took it off about 40 minutes into the ride. The weather got progressively better as we approached Frutillar, our lunch stop. In 1856, 47 German families settled in Frutillar and this village of about 5000 people still maintains many of its Germanic traditions. We had lunch in the German social club, with a menu in German and Spanish that included lots of pork and sauerkraut, as well as more traditional Chilean dishes. I had congrio (Conger eel) that was excellent. We then visited the museum that commemorates the colonization of this part of Chile by the Germans (jointly established by the Chilean and German governments), while Javier fixed my rear tire which was slowly going flat. The afternoon ride was optional because of some very steep hills. At one point my GPS unit showed a 21% grade, but when I uploaded the data to the computer, it looks like our true maximum was "only" 18%. Both of the climbs were in the 10 to 18 per cent range and were quite challenging, even if they weren't long. 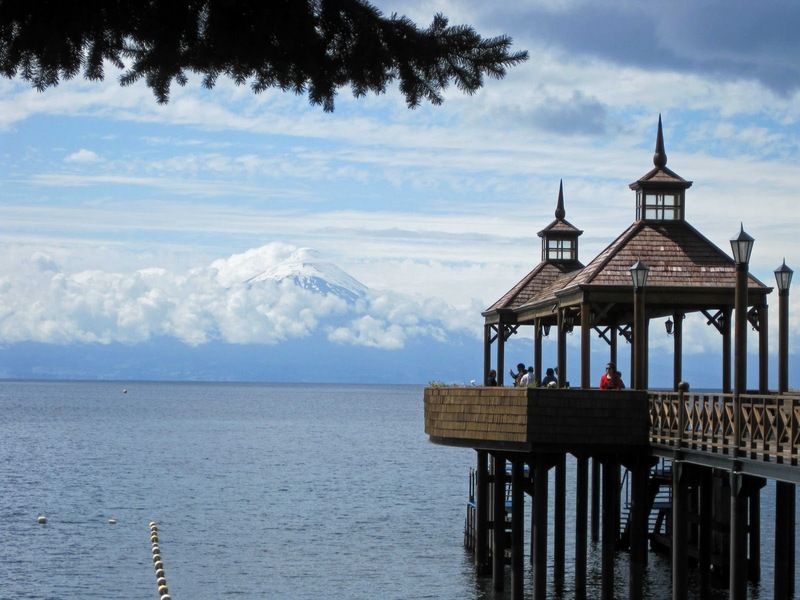 They were worth it, however, because of the fantastic views of the Orsono and Calbuco volcanoes on the far side of Lake Llanquihue. 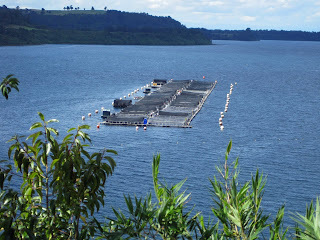 We also saw some salmon farms in the lake. 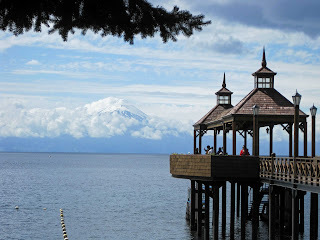 We arrived in Puerto Varas, our home for two nights, in late afternoon. Tomorrow is a rest day, with options of rafting, canyoning, or just relaxing and enjoying the pleasures of Puerto Varas and Puerto Montt. Several of us, including me, have opted for the latter.